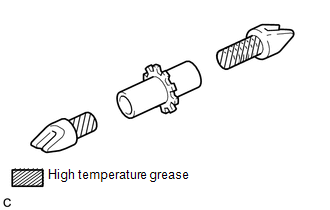 Before installation, apply high temperature grease to the parts indicated by arrows (See page ). (a) Install the No. 2 parking brake shoe hold down spring pin. (a) Install the No. 1 parking brake shoe hold down spring pin. Perform this procedure only when the No. 2 parking brake shoe hold down spring pin is replaced. Perform this procedure only when the No. 1 parking brake shoe hold down spring pin is replaced. 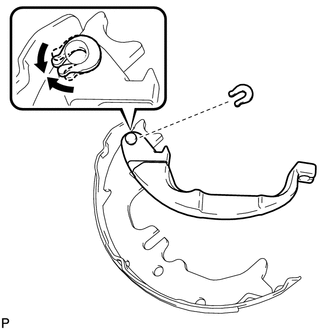 (a) Apply high temperature grease to the backing plate which makes contact with the shoe. 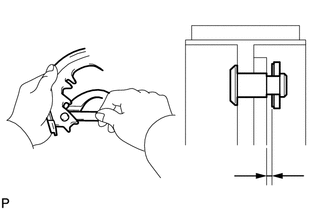 (a) Apply adhesive to the threads of the parking brake shoe guide plate set bolt. 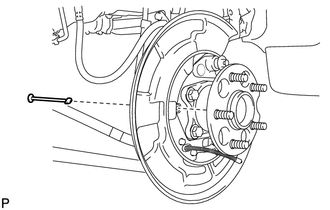 (b) Install the parking brake shoe guide plate and the parking brake shoe guide plate set bolt. 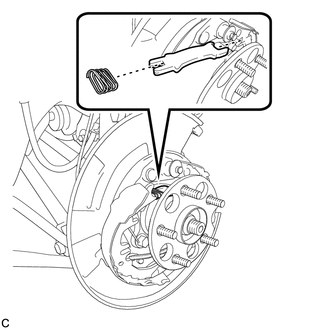 (a) Apply high temperature grease to the parking brake shoe lever which makes contact with the No. 2 parking brake shoe assembly. (b) Install the parking brake shoe lever and shim to the No. 2 parking brake shoe assembly with a new C-washer. (c) Using a feeler gauge, measure the clearance between the No. 2 parking brake shoe assembly and parking brake shoe lever. 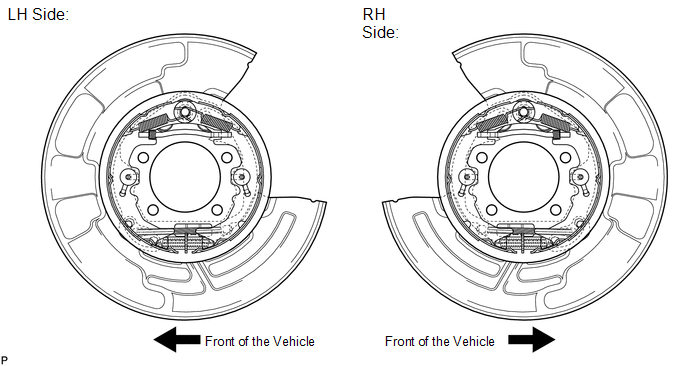 If the clearance is not as specified, replace the shim with one of the appropriate size. 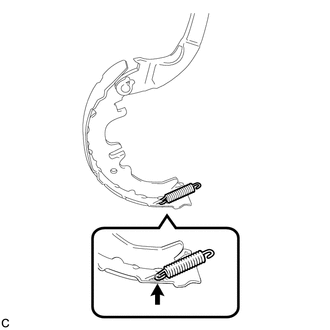 (a) Using needle-nose pliers, connect the No. 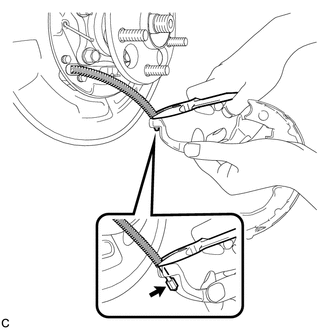 3 parking brake cable assembly to the parking brake shoe lever as shown in the illustration. (a) Install the No. 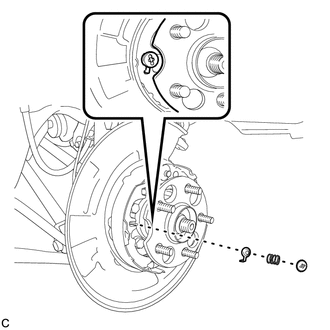 2 parking brake shoe return tension spring to the No. 2 parking brake shoe assembly. (a) Connect the No. 2 parking brake shoe return tension spring to install the No. 1 parking brake shoe assembly. 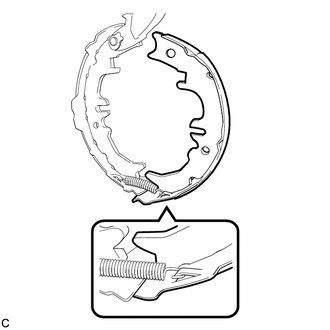 (a) Apply high temperature grease to the parking brake shoe adjusting screw set as shown in the illustration. 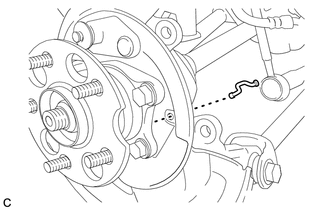 (b) Install the parking brake shoe adjusting screw set. (a) Install the No. 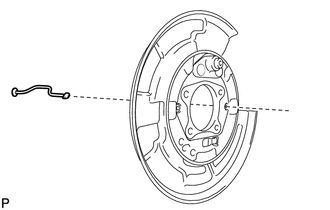 2 parking brake shoe assembly to the backing plate with the No. 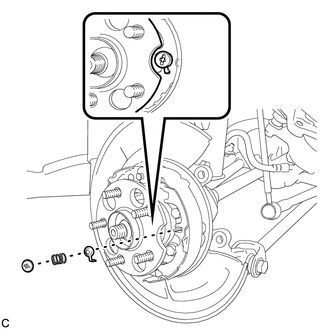 1 parking brake shoe hold down spring cup, parking brake shoe hold down spring and No. 2 parking brake shoe hold down spring cup. 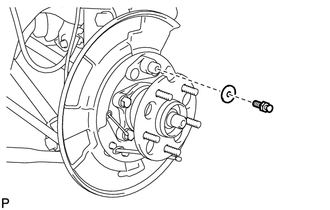 (a) Install the parking brake shoe strut and the parking brake shoe strut compression spring. (a) Install the No. 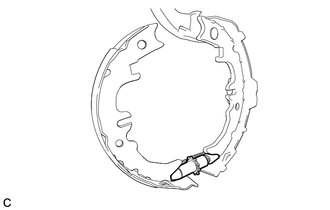 1 parking brake shoe assembly to the backing plate with the No. 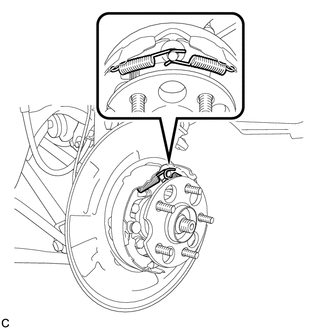 1 parking brake shoe hold down spring cup, parking brake shoe hold down spring and No. 2 parking brake shoe hold down spring cup. (a) Install the 2 No. 1 parking brake shoe return tension springs. First install the front side spring and then the rear side spring. (a) Check that each part is installed properly. There should be no oil or grease on the friction surfaces of the shoe lining and disc. 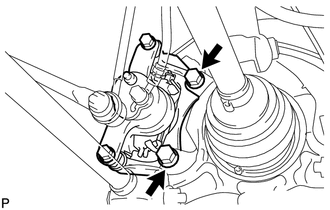 (a) Install the rear disc brake caliper assembly with the 2 bolts. (a) Drive the vehicle at about 50 km/h (31 mph) on a safe, level and dry road. (b) Depress the parking brake pedal with 150 N (15 kgf, 33.7 lbf) of force. (c) Drive the vehicle for about 400 m (0.25 mile) in this condition. (d) Repeat this procedure 3 times. 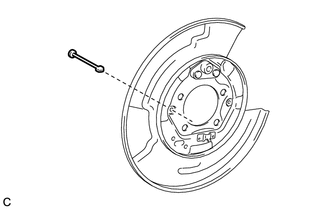 Set a 5-minute interval between each procedure to prevent the brake assembly from overheating.